Oro Express has earned a reputation as a place where you can pawn your items with ease and receive a great price for your effort. The doors of our new pawn shop near Queen Creek are wide open and ready to accept everything from jewelry and electronics in exchange for cold, hard cash that you can use to do everything from making investments and financing vacations to paying bills and floating past financial doldrums. 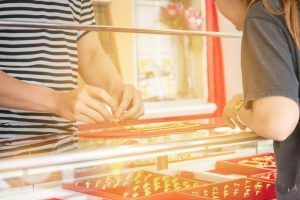 Our clients come from every walk of life and every background in the East Valley, and they pawn everything from gold and silver to watches and automobiles at our location east of Phoenix. Our professional team will walk you through every step of the process and answer your questions to ensure that you understand everything from the terms of the loan to the security measures we utilize to ensure the safety of your possessions. We pride ourselves in delivering the finest and most reliable service for Queen Creek. Whether you need a question answered or need to extend your loan, our pawn professionals will work with you to ensure that you receive the best deal in the region. We know you have a number of options to choose from when it comes to selecting a pawn shop and we do our part to go above and beyond so that we are the only choice you think of when you need a short-term pawn loan to meet your needs. Our team will thoroughly assess the value of your items to ensure that you get the highest loan value possible for your goods when you come in to use them as collateral for the cash you desire. We will even offer tips and advice on things you can do such as professionally cleaning jewelry, repairing damage to autos, etc., that can increase the item’s loan value. We bring more than 20 years of experience into our pawnshop near Queen Creek, which makes us among the oldest pawn shops in the East Valley region. Many of our clients are repeat clients who return time and time again because they know they get a fair deal that is the best deal for the valuables. When you want to pawn your items, we want you to know that we will deliver the highest level of customer service and the greatest value for your goods.